In this iteration of DOOM, you awaken as a nameless and not-particularly-talkative soldier who had been strapped down to a table. Upon leaving your initial prison, you enter your suit, and see the literal Hell that has taken over the facility, the Union Aerospace Corporation's research quarters, with red blood painting the walls, ceilings, and floors and torn asunder corpses all over the place. Apparently, trying to siphon and harness the energy from Hell was indeed a bad idea. Who knew? 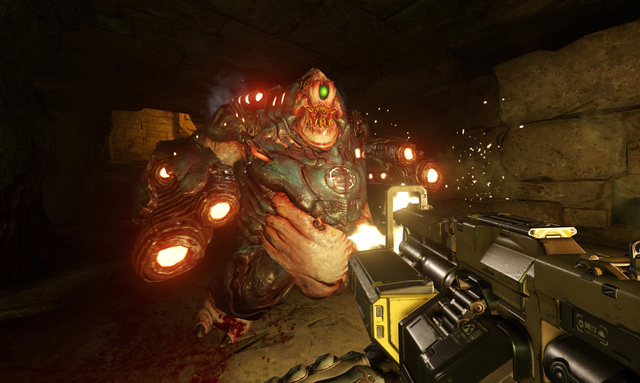 At its core, DOOM is a simple shooter, dumb fun at times, repetitive at others. However, there is no question in mind that this dumb fun, which makes up the majority of DOOM's 13-level length, is sometimes all one needs to have a great time. Running from chamber to chamber, eliminating all of Hell's demons that occupy the room, allows the ability to progress on in a given level. You begin solely with a modest pistol. Shoot a foe enough, and they'll start staggering, flashing a hue of blue or orange. At this time you can run up to them, press the melee button and perform a Glory Kill. This usually results in ripping off a demon's appendage and smashing it into them to make them wish they never escaped Hell to begin with. Glory Kills grant you with a supply of health pickups, making these very important to get considering that DOOM is the type of game that doesn't have regenerative health to ease the burden of battle. A relic of a bygone era in shooters returns like it never had gone away with chambers where you are forced to kill all enemies before proceeding. Unlike the shooters that a lot of us play now, with careful hiding behind cover and popping one's head out to take pot shots at a vulnerable foe, this isn't how DOOM plays out. 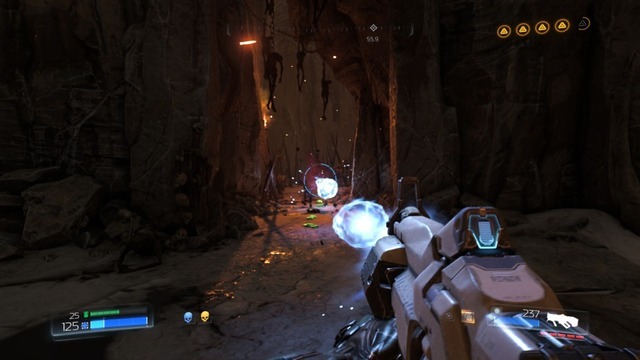 Instead, the game encourages you to rush around areas right out in the open, maneuvering through these chambers of death, blasting away at enemies, picking up health packs along the way, while either blowing demons away with your gun, or performing a well timed Glory Kill to not only gain pickups but also to get a brief respite in the chaos of battle, as performing a Glory Kill gives you complete invincibility during the deathblow animation. Aside from typical demons found throughout DOOM's thirteen levels, occasionally you'll encounter a boss to battle at the end of a level. These confrontations aren't as simple as circle strafing a giant foe while slowly emptying their health bar. No, these fights actually reminded me slightly of the Metroid Prime series' boss encounters, in which you need to be aware of when a boss was telegraphing an attack and evade it intelligently. There's still the matter of aiming at a boss' weak point, slowly plugging away and turning these stronger enemies into demon souffle. DOOM's level design is quite unlike what we've seen out of a lot of first-person shooters in recent years. It's by no means a corridor shooter at all, instead offering rewards for fine exploration of its levels through its labyrinthine-like design. Secrets abound in DOOM's levels, featuring worthwhile rewards like enhancements to your suit, upgrades to your weapons, and collectibles. Many of these secrets are housed in truly clever locations, so exploration is indeed highly rewarding and most importantly, a lot of damn fun. Sure, some can simply be found by just taking a detour when it's obvious which path you should actually be going, but other times more persistent observance of the environment can show hidden things like an out-of-the-way ledge or obscured vent that leads to something massively gratifying. One of the secrets found in levels are runes, which when interacted with, transport the player to a special area where a specific objective is given to them. These objectives include clearing out all of the enemies in a room with limited health and ammo, performing a specific Glory Kill on a set number of foes, or reaching a destination before time runs out. In exchange for completing said objective, the player earns a rune, which can be equipped for a wide host of benefits, such as staggering enemies more quickly, giving the player more control in the direction of their jumps while in midair, and getting speed boosts directly after performing Glory Kills, to name just a few. Runes can be leveled up once to master them, giving the player an even greater level of benefit. In addition to finding runes, field drones can also be found in levels, with some hidden in plain sight. These give players weapon mods to their guns. From performing a charged burst with the regular shotgun to being able to lock on multiple mini-rockets from the Rocket Launcher, these new mods for weapons add to the variety of ways you can take out Hell's spawn, making for even more engaging combat and shooting action. These mods can be upgraded via points earned from exploration and combat. Mods can also be mastered by completing certain tasks a specific amount of times. Take a weapon mod mastery task like with the Super Shotgun, which requires you to take out more than one enemy with one shotgun burst. 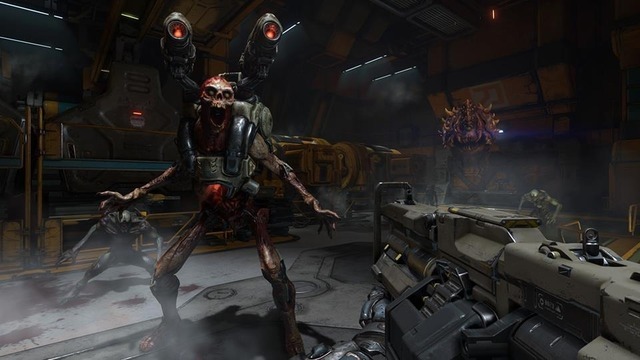 The tasks to master a weapon mod are different between each weapon mod, and this adds to the longevity of DOOM, while also rewarding players for altering their play style. 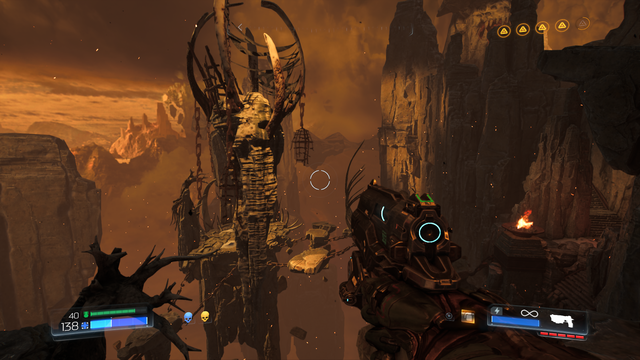 While DOOM's traditional multiplayer is a bit of a bust, the game also features a map-building component known as SnapMap. Here, you simply cycle through level parts and snap them to a grid to create a series of rooms that can be played cooperatively or competitively. The amount of different rooms isn't the largest, and you definitely can't remake old maps from past DOOM games, but what's here is rather exciting and enjoyable. The inclusion of a helpful tutorial assists in giving inspired creators the ability to make some pretty cool stuff. It also helps, along with the tutorial, that SnapMap itself is so intuitive and accessible with its specific tools. With an absolutely masterful single player campaign that hearkens back to old school classic shooters without feeling 100% dated, DOOM delivers new school fun. The levels encourage exploration, and the open-ended approach to combat makes for firefights that give the player control over how they want to play. 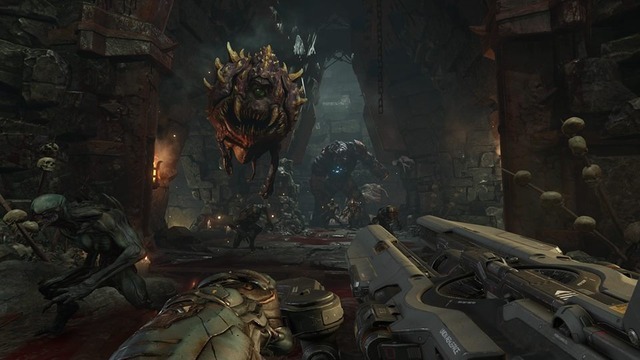 The multiplayer is indeed weak compared to the rest of the package, but overall, DOOM is a blast from the past while still retaining many features from the present.